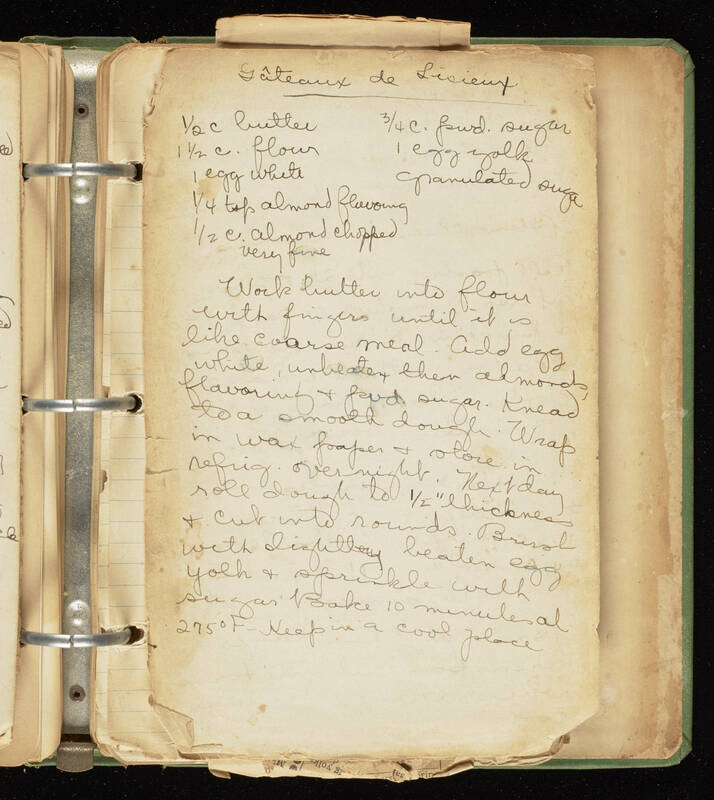 Gâteaux de Lisieux 1/2 c butter 1 1/2 c. flour 1 egg white 1 tsp almond flavoring 1/2 c. almond chopped very fine 3/4 c. pwd. sugar 1 egg yolk granulated sugar Work butter into flour with fingers until it is like coarse meal. Add egg white, unbeaten, then almonds, flavoring & pwd. sugar. Knead to a smooth dough. Wrap in wax paper & store in refridg. overnight. Next day roll dough to 1/2'' thickness & cut into rounds. Brush with lightly beaten egg yolk & sprinkle with sugar Bake 10 minutes at 275ºF - Keep in a cool place.